Tomorrow is a big day in our house. No doubt there will be tears flowing from my eyes. Early in the morning, I will be dropping off JSL to his first day of nursery school. At three years old, he has never gone to school before and is quite excited to do so. This morning, we went to meet his teachers and a few of his classmates. He had a lot of fun making pizza for the teachers, being shy and of course teasing them in his cute little way. I sat back and watched. It is still hard for me to believe that my baby is a preschooler and going off a few days a week on his own. I think allowing our children to grown up and become independent is one of the most difficult items that a parent faces. It is only fitting that this week I selected a book just about this topic that we received from Sterling Children’s Books. 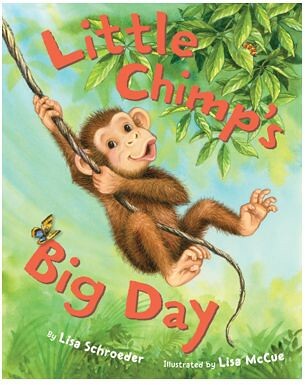 The newly published Little Chimp’s Big Day by Lisa Schroeder and illustrated by Lisa McCue. Lisa Schroeder is also the author of the book that I read over the summer with my older son. I reviewed It’s Raining Cupcakes a few weeks ago. And in a SNAP, Little Chimp is off on a big adventure-taking a watery ride atop a hippo, swinging on vines, and munching bunches of bananas. But as he goes bumping, jumping, and racing across the jungle, he never stops wondering: "Where could Mother be?” Little Chimp may not know, but sharp-eyed kids will see that mommy has an eye on him all the time! An enchanting text filled with rhythm and rhyme, and sweetly charming illustrations. Love – that is what I feel for this book. It truly is hard for me to put my feeling for this book into words since it hit so close to home. 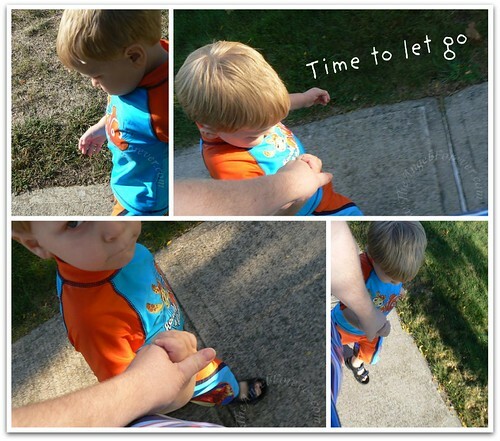 It could not have come out at a better time as I get ready to send my youngest off to school for the first time. Little Chimp’s Big Day is the perfect book for a mother (or father) and child to read together. It shows the love, trust, care and feelings that a parent shares with their child. The book’s message is subtle, yet oh so powerful. Schroeder does an amazing job showing readers how Chimp is spreading his wings and getting some time to be independent in the world. two big eyes, peering through. We follow Little Chimp along as he looks for his mother and encounters other creatures in his jungle environment. My three year old son loved the verbs that described what Little Chimp was doing. He helped to repeat them along with me whether Little Chimpy was bumping, chasing, jumping, racing, grooving, gliding, moving, riding or doing something else. He was also able to know that at the end of each section we would stop with Little Chimp to wonder "Oh, where could Mother be?" In the end, there is a happy ending that not only leads to hugs in the book, but JSL and I hugged as well. I know that tonight, I will be reading this to my little guy again before he ventures off to his first day of preschool without Mama there. I know that he will be fine, but I need to reassure myself with a book and hug at the end. I highly recommend this book to other parents to read to their children before they go to school, head to a different situation or just to remind them that it is okay to try things on your own because your parents will always be there watching over you. This will be a book that will definitely be added to baby gifts for parents to have when they need it down the road (the teacher in me likes to give books). I’ve decided first days of anything tend to be tough because they just mean our little ones are growing up too fast. I hope he likes preschool. W.W. sure did.